Apple's new music-related social network, Ping, is not tied in to Facebook because the website demanded "onerous terms" that Steve Jobs said his company could not agree to. Jobs spoke with Kara Swisher of BoomTown after Wednesday's event, and revealed that Apple talked to Facebook about potential partnerships related to Ping. While the discussions did not result in a deal, there is plenty of evidence that Facebook connectivity was likely a part of Ping until it was pulled before launch. Jobs said the terms demanded by Facebook were ones that his company could not sign off on. However, some have spotted evidence of Facebook Connect compatibility within Ping, leading Cult of Mac to conclude that "Facebook's terms only became onerous at the last minute." Phil Schiller, senior vice president of worldwide product marketing at Apple, even said in an interview Wednesday that Ping would allow users to use Facebook to find their friends. Executives at Facebook also anonymously shared with Swisher their frustration that Ping's layout and blue color scheme resembles Facebook. However, the social networking site's official statement made no such comments. "Facebook believes in connecting people with their interests and we've partnered with innovative developers around the world who share this vision," the company said. "Facebook and Apple have cooperated successfully in the past to offer people great social experiences and we look forward to doing so in the future." Despite the supposed fallout with Facebook, Jobs is reportedly very excited about Ping, and said he believes it could become the most significant product announced during Wednesday's keynote. Other products introduced included the new Apple TV and an all-new iPod lineup. 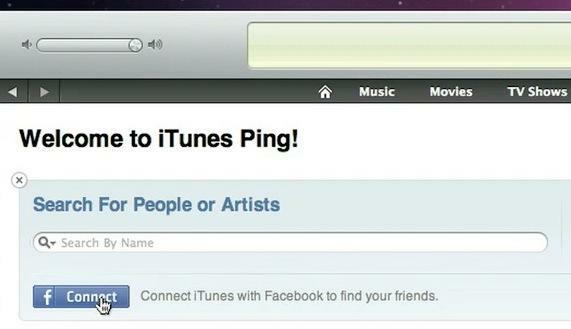 Peter Kafka of MediaMemo, who correctly reported that the new iTunes would be "social, not streaming," speculated that Apple could create an open API for Ping. That strategy would allow Facebook, Twitter and other social networking sites to integrate into the new music-centric service from Apple.